Peanut Butter and Jelly Oatmeal. Ugh. I have been so lazy this break and I hate it. Yesterday I reintroduced vegetables into my life. My food groups before then were resembling that of Elf! It’s scary what a downward slope sugar is for me. By the end, vegetables didn’t even sound good, and physical activity was something I couldn’t even envision myself doing. This happened over the course of 8 days. But, yesterday, for most of the day, I ate normal foods. I incorporated vegetables back in my life and made a delicious dinner that was 60% vegetables. And today, I am starting to feel better. Today is my weigh in day for WW. The damage was 3 lbs. GRRRR. 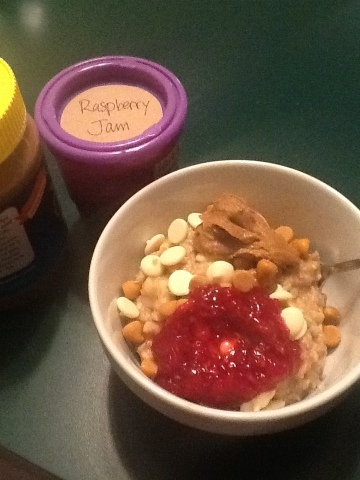 So, today I am starting the day with beautiful and delicious peanut butter and jelly oatmeal. I had received homemade raspberry jelly as a gift from a student so it seemed to be the perfect way to use it. I made the oatmeal with banana, skim milk, and splenda brown sugar (1 tsp) mixed in. Then, I topped it with peanut butter chips and white chocolate chips (1 tsp each), chia seeds, sunbutter, and raspberry jelly. It is delicious. There is a picture at the end of this post, but it’s before I remembered to add the chia seeds. My other goal today is to walk! And to do some floor work. The lady I normally go to gym classes with is with her mother who is ill at the hospital. So, if you are the praying kind, please keep them in your prayers.